Over the last couple of weeks we’ve been combining things here at Hen Corner; Chickens, Bees and Ingredients. Has it been a recipe for success or failure? Whilst it was lovely to have enjoyed a mild winter and early spring, it’s been jolly confusing for the bees here at Hen Corner. Usually, the bees are pretty quiet after their winter lock in; when it’s too cold and wet for them to fly and forage (note: we don’t actually lock them in, they choose to stay close to their queen, huddled for warmth.). Traditionally, we bee keepers would start inspecting our colonies, opening the hives and checking what they are up to, from the beginning of May. This year, though, as it was so warm back in April, the bees were behaving as if it were June! We had a large swarm (the natural reproduction of honey bee colonies), settling very high up on a 20ft Leylandii tree, and needed extra help from more experienced bee keepers in retrieving it. As some winters have been bad for bees in the past, I’d kept an extra colony as an insurance against potential losses. However, all three of my colonies thrived and so I made plans to give away the spare. 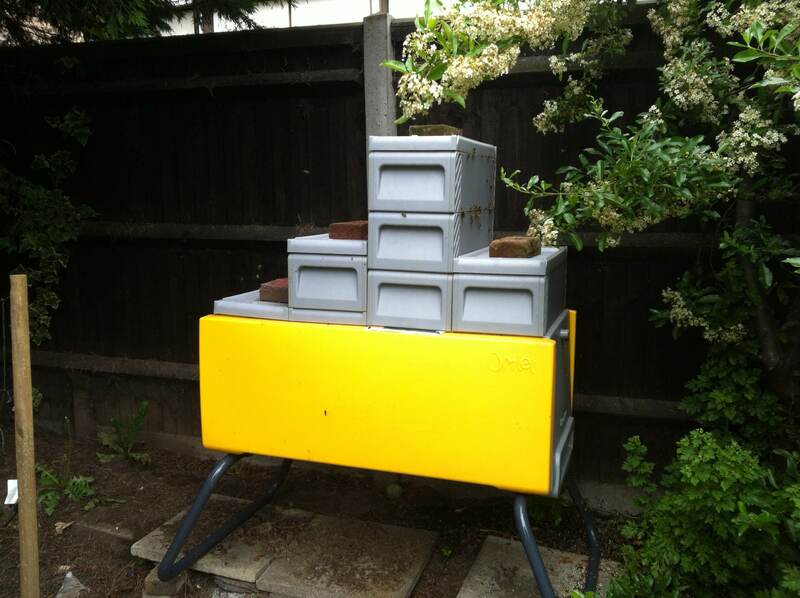 After the swarm in April, we split a strong colony in two giving them extra space and reducing the chances of swarming, I also caught a cheeky caste swarm, so I started with three, gave away two and ended up with four colonies of bees! So, since April, as they’ve been busy rearing new queens and setting up home, not making honey for me, I’ve been planning how I could get them all back where I want them, focussed on the goal of gathering the golden stuff. Combining two colonies of bees is not that straight forward as they are very loyal and territorial. First, we need to locate both queens, decide who will rein, then dispatch the other. Placing one colony on top of the other (see the tower three blocks high) with a sheet of newspaper in between, allows them to slowly sense each other, nibbling through the paper and allowing the top colony access out of the hive through the bottom colony. Once all the paper has been cleared by the bees, the queen’s pheromone can be spread throughout both colonies uniting them as one. I’m pleased to say that the combining has worked well with these two, I’ll be combining two others this week. Well if bees are hard to combine, chickens can be rather feisty when holding their ground against the opposition. Our last post told the story of Madge, our newly adopted hen. Whilst she came with her own Eglu chicken house, we were keen that she made some new friends and joined in with the other big girls. However, if we had put her straight in with the other nine, they could have been very nasty, I’m sure you’ve heard of the pecking order, and done some serious damage to her. We needed to find her an ally. I thought our Copper Black, Duracell, would be hospitable, but couldn’t just pop her into Madge’s home as she would defend it with beak and claw. So, we developed a plan that meant change for all. 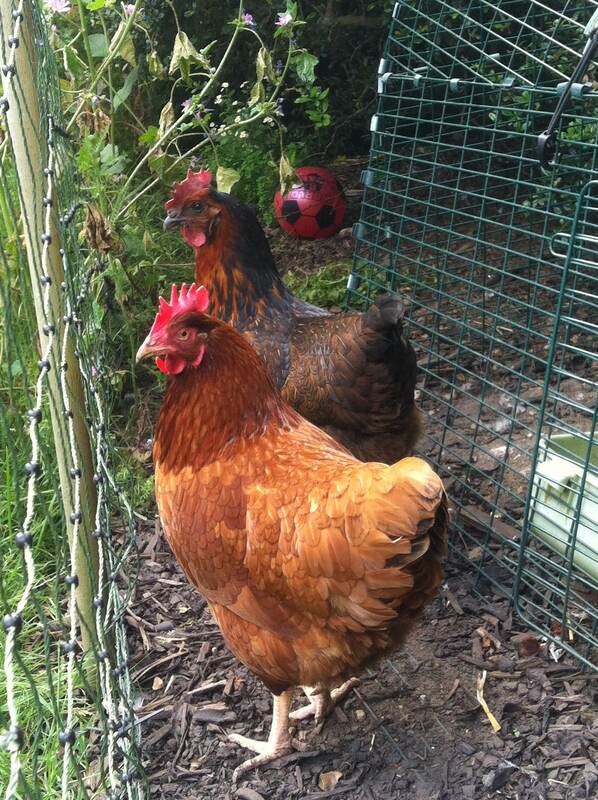 The six bantams moved out of the Eglu Go and into the Eglu Classic (a new home for them). Duracell came out of the Eglu Cube and moved into the Eglu Go with Madge, as it was a new home for both of them, neither had ‘ownership’ so just got on with it. As you can see, they have now become best buddies and will soon be ready to defend each other as they both move into the Eglu Cube with the other eight, leaving the Eglu Go ready for Butternut to hatch chicks in again! We were very lucky, recently, to have been given a box set of seasonings from Saison! We tried combining each blend with some of our favourite recipes, we published our results on Twitter and Facebook and our favourites can be found here. More than Honey: Sara will be looking at the role of bees in so much of the food we produce in the UK, she will be looking at changes in farming and bee keeping over the years and the challenges and benefit of keeping bees today.Who is in the hive? : Sara will explain the structure of a honey bee colony, looking at the nest, the castes, the life-cycle, and roles of each bee.The Bee Keeping Year: Sara will outline the seasonal tasks & responsibilities of keeping bees today including suggestions as to how those interested can find out and experience more. This year we have planned courses right throughout 2014 giving everyone the opportunity for ‘A little bit of country life in London’. Throughout the summer we will have three types of courses available: Introduction to Bee Keeping, a practical hands on opportunity for small groups to inspect our honey making pollinators, Urban Hens, keeping chickens in London and Pick and Pickle, an introduction to preserving. This book, whilst first published in 1984 depicting beekeepers with beards and pipes, was highly recommended when I was studying my Basic Assessment a few years ago. It’s a quality book backed up with a wealth of experience and clearly describes how to unite two colonies as I have just done recently. This book is available with many of our other favourites books from the Hen Corner Shop! Our strawberries and raspberries are ripe and ready to go! Ready, Steady – Bake! This course will get you kneading, rolling and mixing as we make four recipes together using a variety of baking skills.